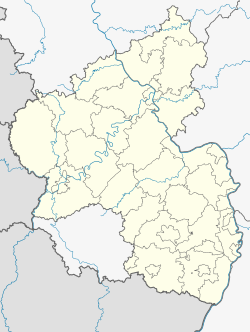 Worms (pronounced /voɐms/) is a city in southwestern Germany in the federal state of Rhineland-Palatinate (Rheinland-Pfalz). It lies on the River Rhine. Worms is famous for its local Liebfraumilch wine. It is an industrial center, producing chemicals and metal goods. At the end of 2004, it had 85,829 inhabitants. Along with Cologne and Trier, Worms is one the oldest cities in Germany. But, there is a disagreement which of the three is actually the oldest. The town is mentioned in the Nibelungenlied, an old Germanic saga. The town was also very important because of Martin Luther who defended his case against the emperor Charles V in Worms. The Cathedral of Saint Peter is a very large church in the town. It is one of only three Romanesque cathedrals in Germany. The other two are in Mainz and Speyer. 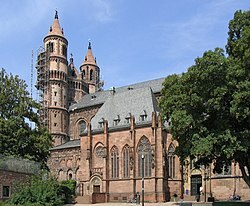 The Worms cathedral is one of the most important Romanesque buildings in Germany. This page was last changed on 27 August 2018, at 09:28.